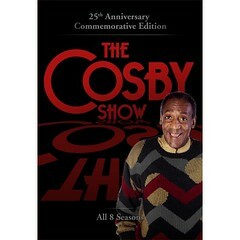 Wednesday night I flipped the channel to a biography of the Cosby Show. I was instantly transported back to my teen years in the mid-eighties. It's not my greatest fashion moment but the music and television, in my opinion, were great. I watched the Cosby Show religiously. And, week after week I wanted to be a member of the Huxtable family. The jazz, the food, the fights and the love. I dreamed of the fun and chaos of having a family later in life. Well, here I am married with two kids and two dogs and life is pretty darn good. Chaotic and frustrating, but good. While watching the biography I realized how much Bill Cosby's comedy has influenced my parenting. The way I interact with our children is uncanny; I have even used one of his classic lines "I brought you into this world I'll take you out." The relationship between Claire (Phylicia Rashad) and Cliff (Bill Cosby) reminds me of my own marriage full of love, laughs and admiration. I even catch my husband sneaking ice cream, cake and chips just like Claire. The genius of this show, aside from the fashion, is it's just as relevant in 2008 as it was in 1984. Cosby's ability to make the frustrations of family life so funny and relatable is a real gift. I am thankful I flipped the channel because at the end of a long day with the kids this show is a reminder of the values and love that I want to infuse into my own relationships. Thanks Mr. Cosby.